We're going to a science lab today, but stick with me – it's going to be interesting, a little thought provoking, and only a little bit nerdy. In recent years, lavender, tea tree, and several other essential oils have been attributed with such dubious abilities as being endocrine disruptors (read: they mess with hormones). But is it true? Let's visit the lab and see, shall we? 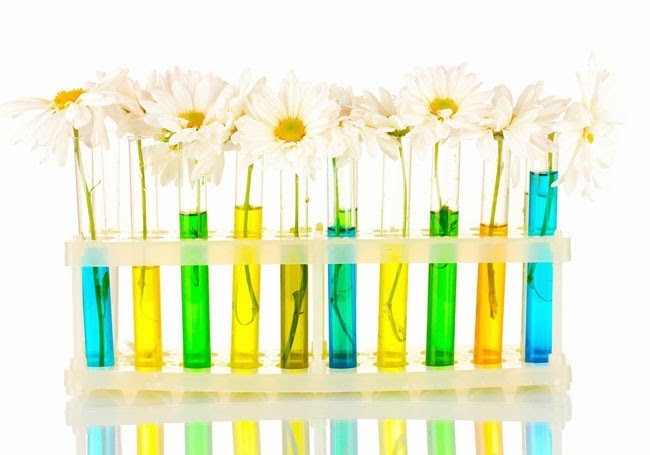 In a science lab, tests on ingredients can be performed in different ways. In vitro testing means the test is done in test tubes, trays, or petri dishes. In other words, no humans, animals, or other live subjects are exposed to the ingredient being tested. Another way of testing is in vivo. I know you've already guessed what that means – testing is done on living organisms such as animals or humans. See? I told you it wasn't going to get too nerdy and you've even learned a bit of geek-speak. 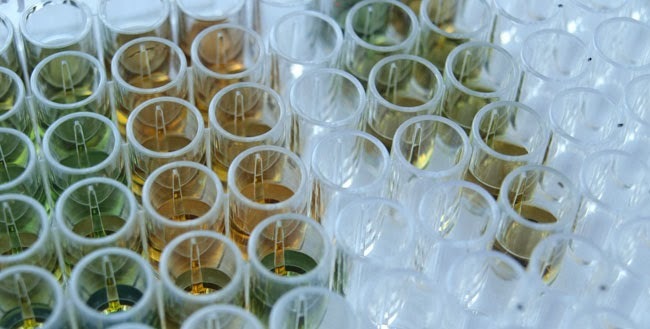 If the results of a lab test on an ingredient shows evidence/indication of something during in vitro testing, then it might be assumed that the same or a similar reaction will happen with in vivo testing, and/or if that ingredient is introduced to a human (either by application or taken internally). It's a fair enough assumption. Obviously, more tests need to be done to ascertain whether or not the assumption is correct. But sometimes, results from in vitro testing will put a stop to further testing. Like, say, if an in-vitro-tested ingredient looks like it has some undesirable properties. So let's say our scientists perform their lab test using run-of-the-mill-lab equipment – like these test trays. These are typical test trays – mass produced and used in labs everywhere – all around the globe. Now let's say our scientists are testing essential oils. And lets' say our scientists happen to be unaware of the documented and established fact that plastics react with essential oils. When plastics react with essential oils, things like (endocrine disrupting) components from the plastic can and will leach into the essential oil. In essence, the essential oil becomes contaminated. Testing contaminated essential oils would make for some wildly misleading test results, wouldn't you think? Both my husband and I have sensitive skin and both react to perfume and perfumed products with varying degrees of itching and rash. Yet neither of us have ever had a reaction to any essential oil. I've been working with essential oils for ages. I realize this is 'only' anectdotal evidence, but when I look at the 'recent discovery' that essential oils have apparantly been tested in plastic lab trays for ages, and factor in my own experience, I just can't help wondering if several of the essential oil components on the European (warning) list of 26 ingredients that need to be declared on cosmetics labels deserve to be on that list at all. Does it seem plausible to you that contaminated lab tests might have caused some incorrect findings on essential oils? Hi there Goodgirl! Thanks for your input - and yes, you are correct, there are some journals that will publish anything.